Paris, Ensba, Masson 898 (formerly Masson 205). Pen and black ink with brown wash, with highlights in gold, on vellum, 14.9 x 21.1. Inscribed in ink at the lower right: Rosso 1536. PROVENANCE: Alph. Wyatt Thibaudeau (Lugt 247; Thibaudeau-Wertheimer sale, December 1871; see Chennevières, 1894); Philippe de Chennevières (Lugt 2072, 2073); sale, Paris, 4-7 April 1900, no. 455, as Rosso; Jean Masson (Lugt, Supplément, 1494a); given to ENSBA in 1925. Chennevières, 1894, 259 and Pl. alongside 260, as Delaune but formerly attributed to Rosso. Masson, 1927, 35, no. 205, as by Étienne Delaune after Rosso. Kusenberg, 1931, 151, no. 50, as a reversed copy by Étienne Delaune of Fantuzzi’s etching; Kusenberg read the date on the drawing as 1532. Masson, 1936, 18, no. 33, as Boyvin after Rosso. Carroll, 1964 (1976), II, Bk. II, 381-382, 386, n. 2, under 42A, as attributed to Delaune and the model for the print attributed to Boyvin. Rome à Paris, 1968, no. 247, as Delaune after Rosso, and used as the model for the print ascribed to Boyvin. Béguin and Pressouyre, 1972, 138, confused with Masson 1196 in the same collection. Carroll, 1987, 276, and ns. 1 and 2, under no. 87, as a copy of a lost drawing by Rosso of c. 1532-1534 apparently by Delaune and the model for his print (but wrongly as always having been recognized as his). Béguin, 1992 (1987), 89, 90, as Rosso’s composition as in the drawing in a French private collection. Brugerolles and Guillet, 1994, 196-199, 197, Fig., no. 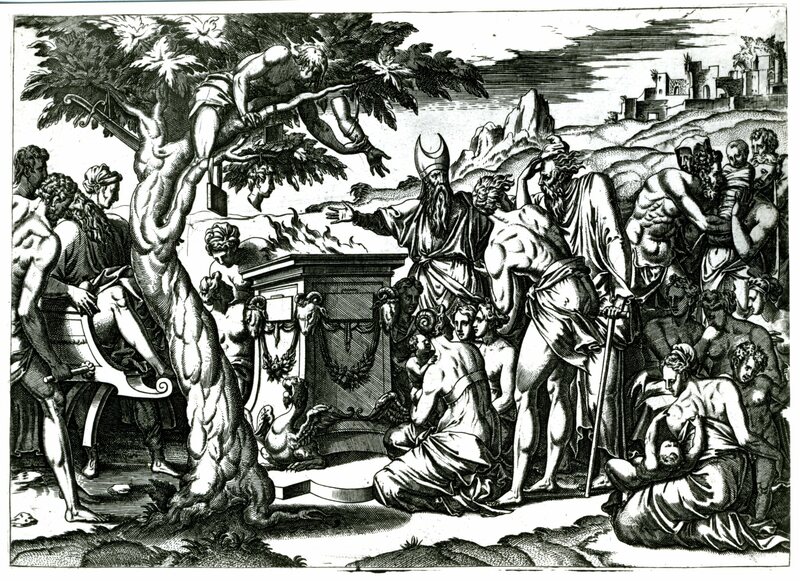 63, as by Delaune after a drawing by Rosso of 1532-1534, or by one of his assistants, its execution on vellum, its gold highlights, and the lack of pricking suggesting that it was probably done from a working drawing that was used to make Delaune’s print. This drawing is of the same composition as D.50, but it shows a few differences in addition to its reversal of the scene. The cornice of the altar is complete with mouldings and the plaques at the sides of it are rectangular with cloth swags rather than simple round disks. No veil falls from the priest’s mitre behind his shoulders. The footrest of the litter chair at the far right ends in a scroll instead of being squared off. The postures of a few figures are slightly different, some figures bald in the other drawing are shown with hair, and a few details of the ruins in the distance are not the same. Furthermore, there is an additional child standing at the side of the seated woman in the lower left corner (the right corner in D.50). All of these details appear in the engraving (E.50) made from this drawing, which in most other respects as well is identical to D.51 except that in printing the plate the image was reversed, making it in the same direction as D.50. As the handling of the drawing is certainly not Rosso’s, it might be thought that the draughtsman simply completed what he considered incomplete in D.50 and slightly elaborated it elsewhere. But this reasoning cannot account for the additional child. It occupies the position of an only slightly differently posed child in the Scene of Sacrifice that was executed in the gallery (Fig.P.22, VII N a). The Göttingen drawing, the most complete version of D.50, shows no signs of this child, but it does show the three women behind the foremost seated woman seen from the back, who, again, is only slightly differently posed from what appears in D.51 and the engraving related to it. The right hand of this woman is not indicated in the Göttingen drawing, but in the lower right corner there is a vertical line, apparently continued farther up, that may indicate the right edge of the composition and show that it is not incomplete here or that the drawing has been significantly cut at this edge. The Göttingen drawing would appear to preserve the full composition of the drawing it copies, which did not contain the standing child or the right hand of the woman. But as this child appears in the final version of this scene, it seems likely that it already appeared in an early version of the Scene of Sacrifice that was in this detail and a few others slightly different from D.50. Hence, it is possible to posit another lost drawing by Rosso made slightly later that served the draughtsman of D.51 when he made his reversed copy as the model for the engraving. Originally, the addition of the standing child and all that appears to the left of him (to the right in the lost drawing) was due simply to the need to widen the scene slightly. One detail in the copy seems still to mark its original width. Approximately in the middle of the left edge of the drawing there is a thin and absolutely vertical fold of drapery that falls exactly where the Göttingen drawing ends, but at the right. This copy has generally been attributed to Étienne Delaune, under whose name it is still kept in the Ensba. In Masson, 1936, it was attributed to Boyvin, to whom the print after it has also been ascribed. The drawing is by the same hand as several drawings executed in pen and ink on vellum that are ascribed to Delaune.1 The draughtsman of the copy had a decided style of his own that does not resemble Rosso’s. As the drawing appears to be the model, if not the disegno di stampa, for the print of exactly the same size, and is in reverse so that the print would be in the correct direction, it is reasonable to assume that the copyist was also the printmaker or that the two worked closely together. The lost original drawing was probably executed in pen and ink and wash, possibly with white highlights on paper prepared with a dark ground, as may have been the case with all the drawings made for the Gallery of Francis I. This technique may have been too complex a model for an engraver. Although I once thought that the date on the drawing was unclear, it now seems to me certain that it reads: 1536. If the copy is by Delaune, which seems likely, then this date cannot be that of the copy. It is not the date that I would assign to the first version of Rosso’s composition, but it coincides with what I suppose is the date of its final version, late 1536 or early 1537. 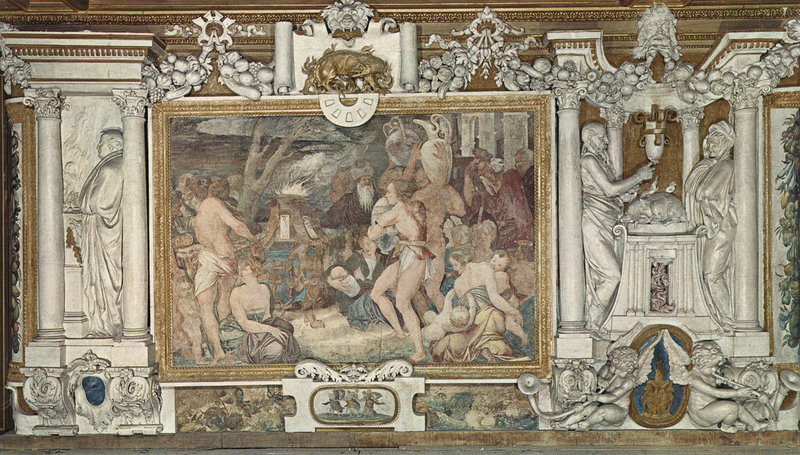 Unless it is simply a good guess on the part of the copyist, it could just possibly record the time, indicated on the lost drawing, of this slight revision of the early version made just before the fresco was to be executed and that was then almost immediately replaced by the final version of the Scene of Sacrifice. The lost original drawing could in fact have been a copy and re-working of D.50 by a studio assistant to which Rosso either added himself or had added from his indications the additional standing boy. 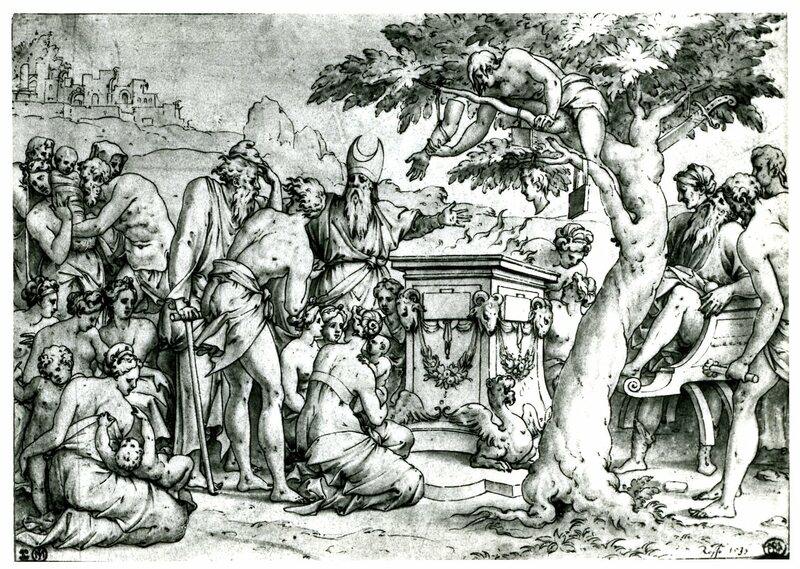 Done on vellum and with highlights in gold, the drawing is not what Vasari calls a disegno di stampa. It has the appearance of a miniature made as a gift that in turn was engraved with comparable precision. PRINT: Attributed to Étienne Delaune, E.50 (Fig.E.50). Engraving, in reverse, for which D.51 was made to serve as the engraver’s model. 1 See Adhémar, 1955, 127, and Pls. 45-47.